Sadallah Kahuk fills an e-cigarette 'pen' with flavored liquid nicotine. Juan Uranga smoked menthol cigarettes for 15 years. Five months ago, the Doral resident started vaping. “Now that I switched to this, I just can’t stop smoking it, he said while shopping at the Vapor Shark smoke shop in South Florida, where he buys his ‘go to’ e-juice – a tobacco-free liquid that serves as a replacement for nicotine. His favorite flavor: custard. Uranga is part of a surge in Floridians opting for flavored, tobacco-free liquid that’s inserted into something resembling a ball point pen. Batteries and a few clicks of a button, and heat coils turn the liquid into smoke. Little more than a decade since they started being sold in the United States, ‘vaping’ has become a popular alternative to tobacco cigarettes – a known carcinogen. But it’s also rising in popularity more quickly than existing health policy or the science on the long-term health effects of vaping. Right now, the Food and Drug Administration is reviewing whether or not to regulate e-cigarettes. And researchers from Miami and Tampa are launching new studies to better understand how e-cigarettes affect the body. 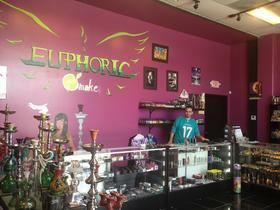 Sadallah Kahuk and his cousin own Euphoric Smoke shop in Hollywood, in a neighborhood with at least a dozen smoke shops. While their store specializes in hookah sales, a tribute to their roots in the Palestinian territories, sales shot through the roof once they introduced the flavored e-cigarettes. Kahuk said smokers like that the ingredients for vaping feel less harsh than what is in traditional cigarettes, and that they can choose the level of nicotine in their solution and how much smoke the e-cigarette produces. He said he thinks it’s healthier than tobacco cigarettes. But that feeling that electronic cigarettes are safer than tobacco isn’t a sure thing, said Dr. Mathias Salathe, a pharmacology professor at the University of Miami. The Florida Department of Health awarded Salathe’s research team a $2 million grant to follow e-cigarette users for 5 years. His earlier research, on animals, found that vaping causes many of the same problems as traditional cigarettes, like inflammation, which can lead to cancer. Salate’s new electronic cigarette study will be one of the first to use human subjects. Over the next five years, the UM researchers will interview patients from local smoking cessation clinics, conduct routine checkups and monitor their health. At the H. Lee Moffitt Cancer Center in Tampa, Dr. Thomas Brandon is trying to see if electronic cigarettes really are effective at helping people quit tobacco. He said unlike traditional nicotine replacements like gum or patches, smokers find e-cigarettes comforting. “They have the theoretical advantage of being more similar to cigarettes in how you use them. You know, the fact that they look like cigarettes, you bring them to your mouth like a cigarette, they produce something that looks like smoke. Smokers often find [it] calming just watching the smoke rise,” said Brandon, whose work is being conducted as part of Moffitt’s Tobacco Research & Intervention Program. Salathe, the UM Professor, said these studies could provide the U.S. Food and Drug Administration with data needed to better understand e-cigarettes. “They cannot regulate something without the science, so the science is interesting for public health policy,” Salathe said. The research also is coming at a time when the U.S. Centers for Disease Control and Prevention is reporting that the number of middle and high school students trying electronic cigarettes has tripled in the past two years. It doesn’t hurt that it’s less expensive than tobacco cigarettes. Uranga, the ex- tobacco smoker from Doral, said vaping has saved him money. “I was wasting about $50, $60 a month, now, here, I’m wasting maybe $20, $30,” he said of basic kits that cost about $20. The liquid vials cost as little as $5 each. There’s the social factor, too. Back in Hollywood, one block away from Kahuk’s Euphoric Smoke shop, Kosta Kokavessis and his friends are trying new e-cigarette flavors at a shop called Carbon Glass. Kokavessis, 20, never smoked tobacco, until he was hired at Carbon Glass. “It’s just fun, like smoking and doing smoke tricks and stuff,” he said. Kokavessis and his friends said they can’t worry if vaping is dangerous to their health. Unlike decades of research – and millions of deaths - that proved cigarettes lead to cancer, the information about e-cigarettes just doesn’t exist. Until there is, they say, they’ll keep their fingers crossed that it’s going to be ok.
“It’s fun though,” he said. Miami Herald intern Jennifer Luna contributed to this report. Ebony Joseph is an intern reporter at WLRN in Miami. WLRN is a part of Health News Florida, which receives support from the Corporation for Public Broadcasting.